It is rare that I present a Second (Sous chef) in this series, but there are exceptions and Yoji Tokuyoshi is! 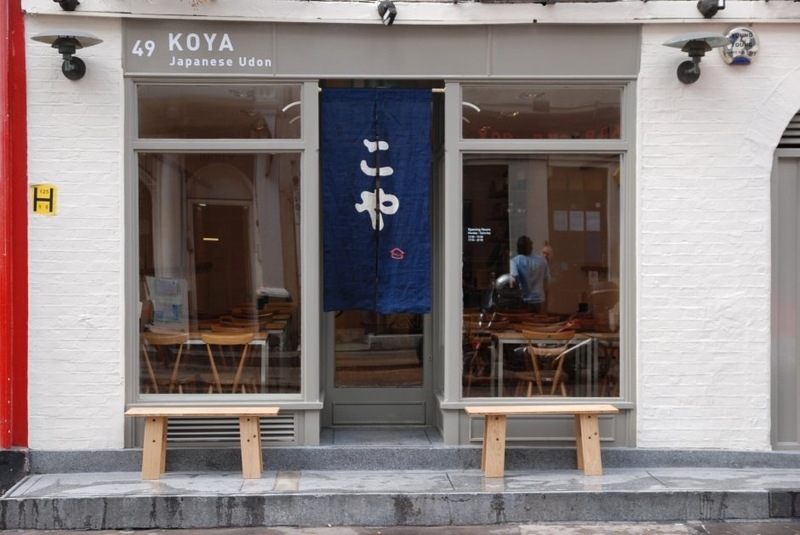 As Second of great chef Massimo Bottura, Yoji has a chance to evolve in an environment dedicated to products, traditions and above all, creativity. For a passionate chef, curious and loves to experiment, it is hard to find better. 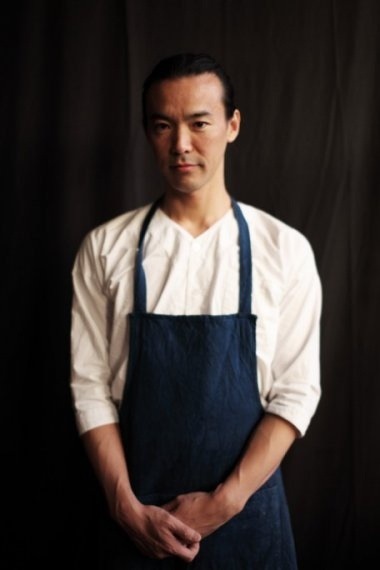 Chef Yoji Tokuyoshi was born in Tottori (Southern Japan) in a family of pharmacists spanning six generations. Being the first to become a chef in the family, he has always been considered the black sheep. Beyond his learning in Japan and his work at the Osteria Francescana (over 6 years), the chef made an internship at El Bulli in 2009. His cuisine is (slightly) the meeting or the clash between the best products of Italy and its Japanese roots, not to mention the influence of Massimo Bottura! What gives a particular aesthetic, precise, maybe inspired by the art of photography (one of his passions). YTokuyoshi– My creative process is spontaneous. As I work I get an idea and an inspiration is born. It all happens while touching the ingredients, repeating a gesture or reflecting on my everyday work. From there, I try to develop the plate using the techniques that I think is necessary to achieve the objective that I have. But that might not be the end of the it. A plate is never done until I stop asking what I could add or remove to this plate. 2-(Scoffier) How and why did you choose to work with Massimo Bottura? YTokuyoshi- It was definitely fate. I was about to leave Italy because after an internship at a restaurant in Umbria because I had not found a job in any of the restaurants that I had called. I only had € 50 and a return ticket in my pocket before arriving at Malpensa,when I saw an italian guide of restaurants (L’Espresso), I used my last euros to purchased the guide and randomly selected a name in the guide. Guess what? It’s been seven years and I am still there. YTokuyoshi- Obviously, I am Japanese, the ingredients that my grandmother prepared at home: Tofu, Miso, Soy Sauce … but the thing I really remember most clearly is a simple sweet, perfectly ripe strawberries just flatten with the spoon in milk and little sugar. 5-(Scoffier) Do you have a mentor (chefs or anybody else) that inspires your cuisine? YTokuyoshi- Massimo Bottura! Only him, I like his philosophical approach to cooking. 6-(Scoffier) Is there a movement or a chef as you watch carefully now? YTokuyoshi- I like those who combine a great idea with the local ingredients, those traditions have often forgotten. The chefs as Alex Atala in Brazil or René Redzepi in Denmark. 7-(Scoffier) How do you develop (inspirations) your recipes and how did you work with chef Bottura (creative process)? YTokuyoshi- As I said in my first response, the creative process comes from work everyday, when I am able to give shape to the plate, then I brought it to Massimo because he is the last stage before the final fulfillment. 8-(Scoffier) I look the photography of your dish (at Osteria Francescana) and you have a really particular and great aesthetics, food enters in the world of art. It’s important for you to have a theatrical presentation of your dish? YTokuyoshi– For me, it is fundamental, any means by which the pot can be used to communicate. Surely that the beauty is decisive in the success of the dish itself. 9-(Scoffier) Can you give us a detailed recipe (Signature dish or other) that is characterized the cuisine of Yoji Tokuyoshi? YTokuyoshi- Recipe: Probably my signature dish was presented in May (2011) at the Loft Project: Blood and Ash. 10-(Scoffier) What are your goals (ambitions) as chef? Do you think about write a book, a television show, a restaurant, others? 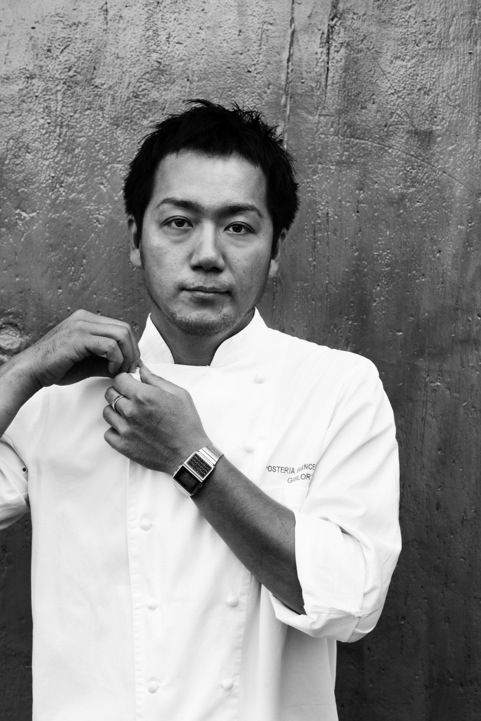 YTokuyoshi- I want to become a chef that influence the work of young chefs who look at me as an example. I would go on television to explain how you can cook at home easily and the result is tasty. 1. Make an infusion of one night of the milk and cream with ashes and truffles. Bring it to 80 °C and then leaving to cool to room temperature. 2. Once cooled, blend very well, pass through a sieve, add the egg whites and put everything in a Pacojet. -500ml of high quality strawberry juice concentrate to 100 ml in the Rotavapor. 1. Mix the powders then add the egg and the melt butter. Roll out the dough on a baking tray and bake 8 minutes at 180 °C. Let it cool and crumble slightly. 2. We served the ice cream over a few crumbles of cocoa bisquits and finished with a splash of strawberry concentrated (fake blood). 3. This dish was created in homage to Wimbledon (cream, strawberries and grass), working on my memory of strawberries and milk from my childhood.